WB and EB with US 219 SB and NB. The multiplex used to be on the east side of town, where Business 219 now runs. 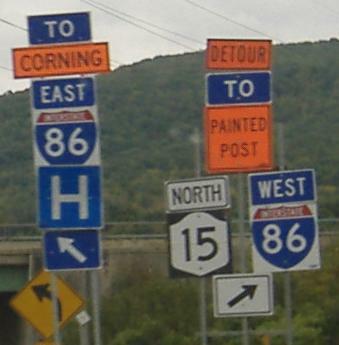 Bringing 219 onto I-86/NY 17 defeats the purpose of a bypass, because it then sends traffic right through the heart of Salamanca instead of avoiding it to the east. Sometimes, the route with the higher speed limit isn't faster. 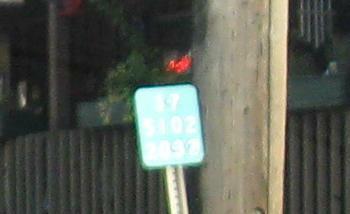 The second photo shows that NY 417 was originally NY 17, hence the number and the tendency to parallel the parent route. 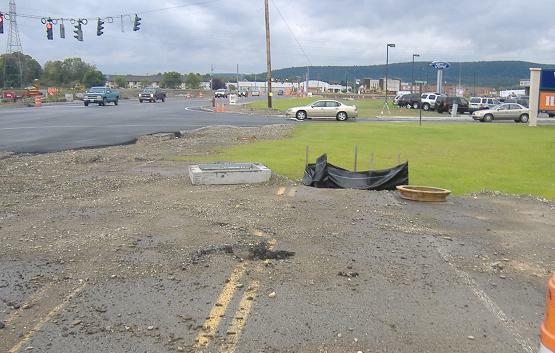 Old shields in Olean, WB and EB just west of NY 16. 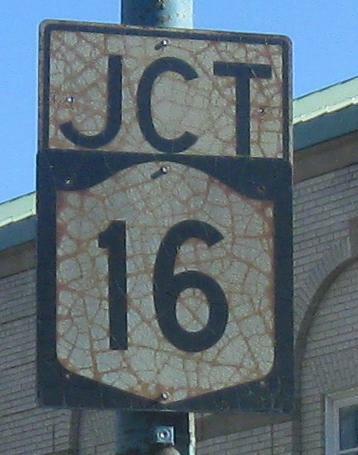 The second one is older because of the old font, but there is even older to be found on NY 16 (click the link at bottom to see it). 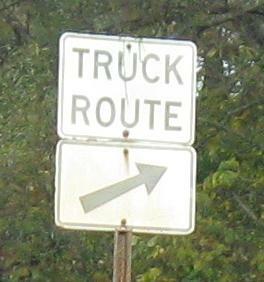 RIDOT-esque signs off the current end of NY 417 at US 15 Exit 3. The NY 15 shield is correct, because US 15 turns into NY 15 once it hits NY 17 (as I noted above), but it's a little strange to be sending people south in order to head north and west. Going north to NY 415 and then heading west would make a lot more sense. At the traffic signal begins NY 417, which heads south and west as the piece of old NY 17 that is farthest from the new I-86/NY 17 (and in this section, was also old US 15). 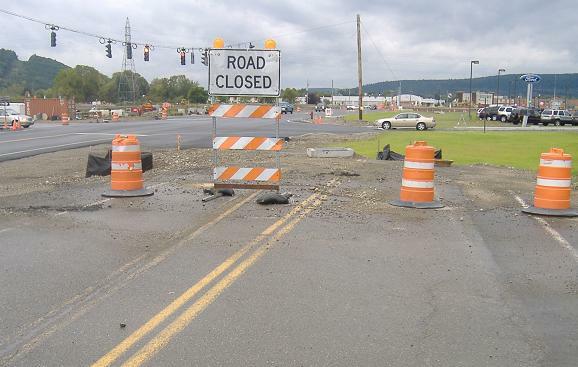 As you can see, this intersection was recently realigned, and it is due to be realigned again after the US 15 freeway connection to I-86/NY 17 opens. At that point, NY 417 is to be extended north from here at US 15 Exit 3 (exit signs will get numbers probably when I-99 comes up from PA), across a new creek bridge, and tying into the current NY 17 overpass south of NY 415 (which is, naturally, old US 15). 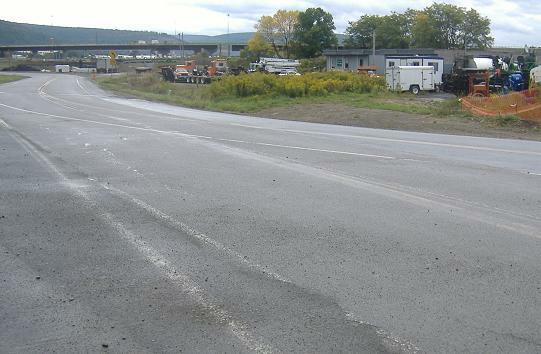 Looking north from that same intersection; NY 417 will head straight in the background, whereas the current road heads sharp left. For those who have come here from the Elmira Meet page, the group photo was taken at that bend in the road. Heading north on future NY 417, up the dirt pile to look at the already-constructed abutments over the creek and valley. The skew of the abutments (no, I don't know why they're angled with respect to the road, must be a topographical issue) will allow NY 417 to make it up into the current US 15. 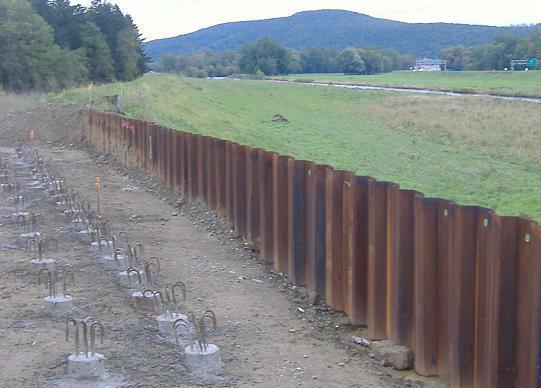 All set for a concrete structure to hold up the southern end of the NY 417 bridge. A look at the US 15 bridge over that creek, on life support. 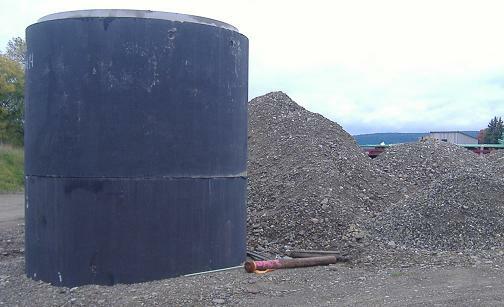 Caisson! 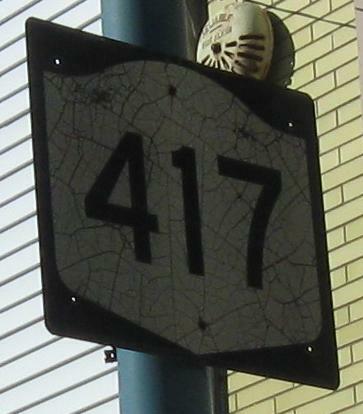 More of the future NY 417 (new old NY 17, for those keeping track).